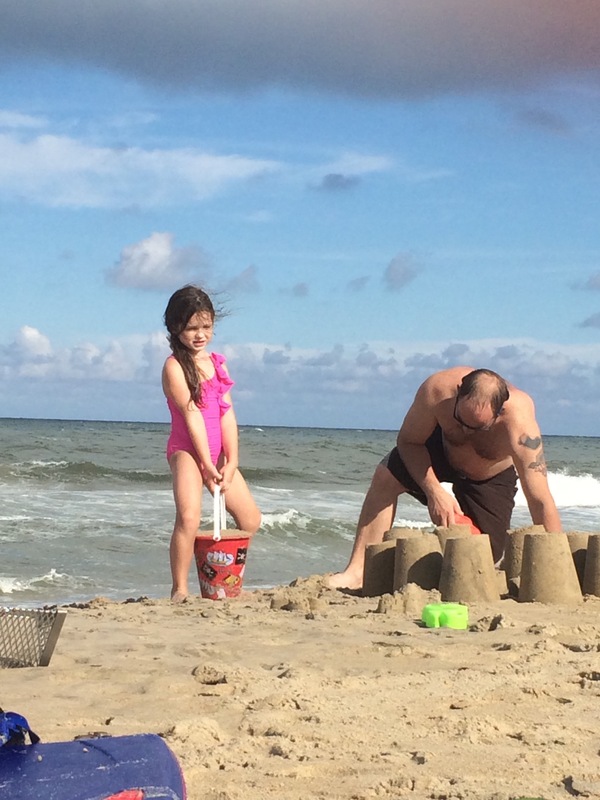 Her sandcastle is almost complete. “Hey!” she yells indignantly as the waves come up to carry it away. “Hey!” she screams again as if the ocean acknowledges the desperate pleas of a mere child. Naivety and innocence seem cruel deceivers as she begrudgingly submits to defeat. For a moment, time stands still. A little girl’s demand at the deaf deluge pulls back the curtain on the spiritual. I consider the contrast between God’s grace and my whimsical demands. I quell her disappointment with a hug. The flood becomes my eyes as the character of a God far bigger than the ocean reminds me of his great mercy. I am the little girl building and bargaining. I am the child, unwise and oblivious, pouring all I have into the futility of sinking sand. Entitled, I am the angry toddler begging that my bucket loads of broken pebbles would not be buried. But buried they must be, lest I trust in them. No matter, because my vast ocean hears my “Hey!” He envelopes me. He is never deaf. Despite his deity, he acknowledges my disappointment like a mother – a father – he quells my fears and failures with his ever proximal presence. Later, the little girl carries her light to look for crabs. When the covering of crustaceans is made clear to her, she screams. She grabs my once unwanted hand and cuddles close. She wants carried. She clutches her tiny light and she cries out. She shines it to the sky avoiding what’s on the ground beneath. The brightness fails to reach up, but a grand array of stars reach down. She wants to go home but she must wait for Daddy’s word. She is me. So unaware. So dull. So ready to walk alone until she is shown what waits fast under her feet in the darkness. Her frailty is revealed in her fear and she fumbles for faith. She grasps the little light she has and she tries to force it far enough to find favor. Just then favor finds her. Favor reaches down. Favor forgives. Father. Father allows her to fit fully in his lap until he gives word that she can finally go home. The house I built on the sand may have fallen far away. My castle, my kingdom must have come down. But the ocean heard my “Hey!” and my Father came to save. Unfortunately this is not an unfamiliar or outstanding scenario in my home. I have two who dabble in the art of manipulation through obedience and one all out rebel. I guess it should be no surprise that two sinners managed to breed three more sinners. Teaching my children at home affords me a commodity other parents do not usually have an abundance of – time. I have lots of time to spend correcting, encouraging, punishing, rewarding, and teaching them how to be a respectable, responsible, literate member of society. Well, those are my three main goals on this joyride anyway. Still, more oft than not I find myself at a total loss for how to get there. I’m realizing that it may be because I personally don’t always know how to get there. I’m a sinner, too, after all, and why I ever expected to clone myself and end up with a better version is beyond me. All I got were three, going on four, carbon copies. Drat. If I want to help them and retain my sanity, I have to figure out how exactly it is that God changes me. We began a group study on the book of Proverbs. Proverbs offers wisdom for life and godliness. It got me to thinking, more or less, evaluating, what wisdom is practically in my life. What does wisdom look like day in and day out in my relationships, my demeanor, and, especially, my parenting? All I could think of was star charts and how much I hate them. So I left Bible study scratching my head asking myself why do I hate star charts so much anyway? I hate star charts because I am daughter number one and daughter number three. I’m the recovering prideful obey-er who is ever tempted to manipulate Pharisaically. My husband is more like daughter number two – the act first, think later out and out rebel. Nevertheless, truth be told, we are both, both. Therefore, I know star charts will only feed the already existing pride and arrogance of daughters one and three. I also know that nothing short of prayer, fasting, daily Biblical instruction, and likely a few lost limbs and several nervous breakdowns will stop daughter two. Ok, maybe none of that will stop her. But I have to try, folks. God, help me. Pastor says the way to avoid prideful, heartless obedience is to preach the gospel. Everyday. He says the way to avoid lawless rebellion is to preach the gospel. Everyday. Preach it to yourself. Preach it to your children. Yes and amen. My question, and forgive me once again for my ignorance as an 18 year old Christ follower who should sure well know better by now, is still, how? Practically, daily, how do I do that? Because I do study the Bible daily. (It’s a high ranking item on the star chart for me.) I open “school” for the kids with “Bible class” and everyday we “talk” about what the gospel is, what it means, and the like. We have Bible based history, science, reading, Bible study, Sunday school, Bible memorization, nighttime devotions, family prayer, individual prayer, etc. I could go on. Still, as five spoiled sinners we have a mind blowing capacity to learn and know without doing and living. That’s why I no sooner begin reading the Bible lesson and a crayon fight breaks out. It’s why I don’t finish the lesson for my anger over the said fight. It’s why no one gets it even if I do finish. My kids aren’t disobedient because they do not know the gospel. They are disobedient because I am disobedient; because I am all too often not rightly applying the gospel I teach them in my own behavior. I know what you’re thinking. Someone needs a star chart. Perhaps. I think maybe the pastor is right, though. In fact, I know he is. But what kind of star chart follows the gospel? Now we have a usable chart. I mean, maybe it’s ok to remember the good things we do. Well, as long as we don’t tell our left hands. (See Matthew 6:3.) Maybe the chart just needs another side. It needs balance. It needs a “bad things” side where we write those, too, so that we might remember, confess, and have to physically erase them afterward. After all, wasn’t that the fault of the Pharisees? They kept a record of rights they should have been forgetting and never considered their own sin they should have been remembering. In so doing, they refused the gospel. No one whose star chart is full on only the good side needs a Savior and no all out rebels care much about getting stars on either side anyway. There must be hope for both kinds of sinners! While the religious sinners are asking, “Why wouldn’t Jesus love me? 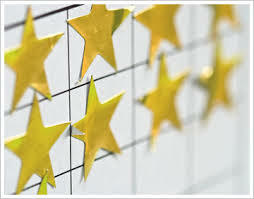 My star chart is full of good!” and the rebel sinners are asking, “Why would Jesus love me? I don’t even have a chart and if I did it would be full of demerits!” we must be responding with grace rather than stars and demerits. The answer to sinner number 1 is grace-filled correction and rebuke urging the consideration of personal failures, confession, and repentance until they realize how counterproductive and contemptible their good works are to their spiritual life. The answer to sinner number 2 is grace-filled correction and rebuke urging the consideration of personal failures, confession, and repentance until they realize how counterproductive and contemptible their bad works are to their spiritual life. Both types of sinners need the gospel, but giving it to them looks somewhat different practically because we sin differently. Star charts don’t work but the gospel does. Who knew? Insert head into hands. As I finish typing this little ditty ipod void Addie urges correction for her playing on her ipod before she got ready for school sister. “I think she should get her ipod taken away like me because she’s doing the same thing I did.” Rebel turned tattle; tattle turned rebel. Can a girl even get some consistency around here??? Excuse me while I attempt to start preaching living the gospel again today. God’s people had become slaves in Egypt. Moses was still tending sheep in the desert. The people were groaning under their heavy work load and crying out to God for rescue. In just two short verses, we find the kind of God we all long for. Firstly, God heard their cries. Of course he heard. He hears and knows everything, right? This is not a mere audible sound going into the ears of God, though. The text implies that this “hearing” is one of response. God always hears, but after much suffering and slavery as these desperate cries go up to Him, God now prepares to act on behalf of his people. The text also records that God “remembered” his covenant promise to these particular people. Had God ever forgotten? Of course not. The author means to convey that God has taken special notice of his pleading people and he is preparing to act on account of his own faithfulness – not theirs. God remembers and keeps his promise to these people because of who he is and who they are to him – not because they deserve his mercy. Finally, we learn that God “saw” them and “knew.” God never went blind. These was never a time in all four hundred years they spend enslaved in Egypt that God misplaced his people. The implication is that God’s eye was turned toward their need as they cried out to him. He knew them as his very own children. He felt compassion toward them and sought to rescue them. He looked upon them as the very apples of his eye and he knew well their pain. When pain and suffering are laid heavy upon us it is good to know that Our God is not deaf, forgetful, blind, or ignorant to our needs. 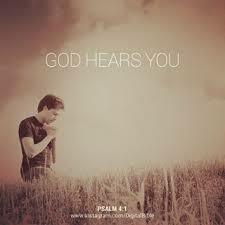 He hears us. He remembers us. He sees us. He knows us. He always hears, remembers, sees, and knows us, but there is an appointed time for his deliverance. It is often not as quickly as we prefer, but he is always faithful. He is faithful because of who He is – not who we have been – and he will surely respond to our cries in his appointed time. Keep praying. 2:49 a.m. – He sends a text that tells his wife he’s almost home and can’t wait to put his arms around her. He’s been drag racing again. Normally, she would be there cheer leading from the eardrum breaking bleachers, but the the race track is no comfortable place for a woman with child. His friends may think that having a supernaturally fast street car, an even faster race car, and a bread-winning business to prove it is what makes him most respectable. But we both know better now. Don’t get me wrong, his gifting is found in gears and gadgets. He has given his life and livelihood for building things to go. Fast cars bring home the bacon – bacon, by the way, whose “better eat me and broadcast it if you’re a big man” blasphemy has created a sincere aversion for him. No. Tim has not bought in. Bacon hasn’t the slightest thing to do with being a man. Neither do beards or how much of it (bacon) you bring home. Being a man, brothers, is found in something a little bit bigger and badder than that. 8 a. m. – He gets up early on Sunday morning after his 3:30 a. m. return from drag racing to go over the Bible lesson he’s about to teach the children at church. He takes the dogs out, brushes little girls’ hair, and eats a breakfast void of bacon. 9:30 a.m. – He turns the car around when his wife remembers something she forgot. He laughs instead of yelling. Upon returning, he gets out and kindly get the said item for her. 10 a. m. – He teaches Sunday school, complete with funny faces, friend-making foolishness, and all the same fervor he has when fueling up his fast cars. 1 p. m. – He buys lunch for extended family. He takes them to the river to picnic and play. He picks his wife a wildflower. He buys his daughter a heavily overpriced elk skin purse, his other daughters a wooden trinket and his wife a handmade flower for her hair. He teaches them about nature and geography with enthusiasm. He sneaks away and buys them ice cream. He baits their fishing poles with slimy worms they can’t bear to touch repeatedly. 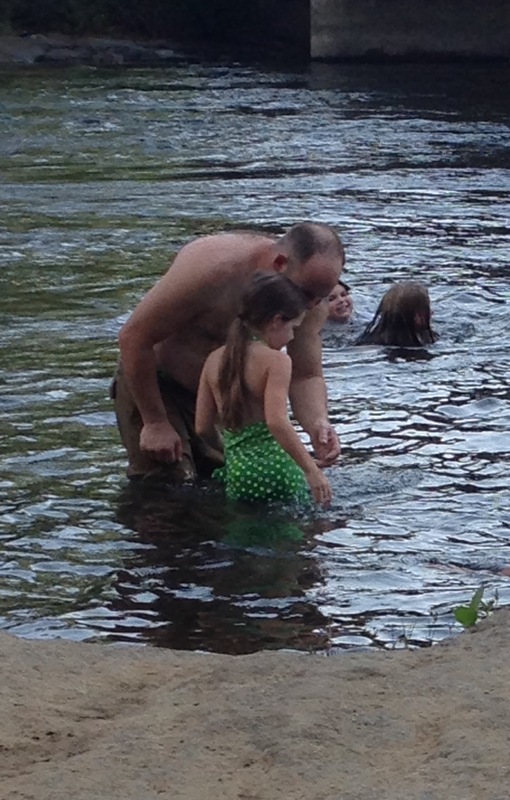 When the pregnant wife wants to wade in the water, he holds both her hands and leads her carefully. He carries everything back to the truck. He always drives. 7 p. m. – He sits down on the couch and watches a kids movie. He rubs his wife’s feet and doses off unintentionally. 10 p. m. – He tells the kids a story, prays with them, and puts them to bed. He lays down with a sore back. He talks with his wife for a while and then prays with her about the trials of the upcoming week. He remembers those in need, in pain, in leadership, in darkness. He thanks God repeatedly. He asks the Lord to bless his wife and children. He plans to get up early for a walk with his wife before working all day on a holiday. He wins. Not with his race cars or his worldly wealth. He knows that can be taken away. He wins the hearts of those around him because he has put away self-indulgence. He has refused the lies of worldly gain and it has been revealed to him what is worthwhile. The measure of a man is never about his net worth, his appetite, his appearance, or his material possessions. The measure of a man is most evidenced by his love for God demonstrated by his love for others. Big beard wearers, bacon eaters, big car builders, take note of Mr. Rodeheaver. He has taken note of Christ. Moses fled from Egypt out of fear. He had killed an Egyptian man on behalf of the Hebrews. When he realized someone had seen the crime, he ran away into the desert to a place called Midian. In Midian, the Bible says Moses sat down by a well. Some women came to draw water and were attacked by shepherds. For the third time, we see Moses act on behalf of the weak to serve justice. His actions prove a pattern of character. Moses was a defender of the weak – like unto God. Despite his sin, the Lord blessed Moses for his courage and gave him a home and family in Midian. He became a shepherd. God provided for Moses and prepared him for his future work of delivering Israel. Moses was not on a mission to save all God’s people when he struck down the Egyptian. He was looking to save one. He wasn’t looking to be the judge of all Israel when he sought to reconcile two Hebrew men. He was trying to make peace between two Israelites. Moses did not expect to gain a family by standing up for a few women in distress. In all of these instances, Moses was just being who he was. He was doing what God-fearing men do – protecting, defending, and seeking justice for the weak and oppressed. He sounds a lot like his mom. God used his courage and hunger for justice and, over the next forty years, grew him into a great deliverer. What we don’t see is Moses running around vying for a position. He had one that he, apparently, did not overly value, in Egypt. We don’t see him seeking favor with men or worrying what would happen if he stood up against evil. He acted impulsively according to his instincts. We never see him asking God to make him a leader for Israel. In fact, when called to leadership he attempts to decline by making excuses. All Moses’ life is weaved together by nothing less than the providence of God. From his birth to his need to defend to his desert escape to his new-found foreign family, all the way to his calling, his courage, and his great task of delivering Israel out of Egypt, God sovereignly gave Moses all things according to his own will. Here is a lesson for us – for we who chase the doing rather than living in the being of our humanity. We needn’t busy ourselves seeking positions or popularity among God’s people – or any people for that matter. The way to pleasing God is not found in frantically finding a way to become a front-runner for him. Instead, we ought concentrate on simply being who we are in him. We ought to focus on being like him – hungry for justice, quick to defend the weak and oppressed, recklessly abandoning all that is opposed, and trusting fully in his providence. That is who Moses was. It wasn’t that Moses just so happened to be in the right place at the right time. It was that Moses was just the right man for the life God had called him to live out. The very same thing is true for each of us. Act Be accordingly.